"Jerry Lewis MDA Telethon 2007"....Aerial Silks....National T.V. "Inhale"..Yogini(35 episodes)..Oprah Winfrey's Oxygen Netwk. S.F. Architecture Firm......Aerial Silks Duo.....San Francisco, Ca. Burningman Festival...Aerial Silks, Rope, Fire Hoop....BRC, Nv. 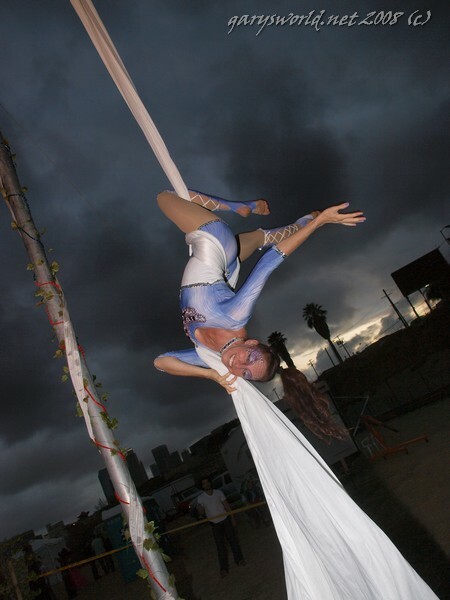 Joshua Tree Music Festival.....Aerial Silks.....Joshua Tree, Ca. Orbit- Alcyone Concert...Aerial Silks Duo...San Francisco, Ca. Hamsa Lila Concert..............Aerial Silks..............Topanga, Ca. Women of the Canyon.........Aerial Silks.........Topanga, Ca. "The Spiral Dance"..Aerial Silks, Dancer, Priestess......S.F., Ca. "Call Me By My True Name"...Dancer, Actress...Santa Cruz, Ca. Vortex Theatre's "Kassandra".....Dancer, Actress......Austin, Tx. Imagic Dance Theater Co...Modern Dancer..San Francisco, Ca. Swing Brasil Dance Co.......Samba Dancer.......Los Angeles, Ca. Ballet- Mark Lopez, Alonso King etc. Myra Turley, L.A. Reperatory Co., U.C.S.B. Performers Insurance- Clowns of The U.S. Custom Costumes made to fit the theme and colors of an event.